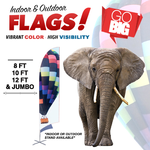 Feather Flags Printed in Full Color One Side on 3oz Polyesther Fabric with Indoor or Outdoor Stand Available in Sizes 8ft, 10ft, 12ft, "12ft jumbo" or 15ft colossal. Printed in Full Color One Side on 3oz polyesther fabric. Sizes 8ft, 10ft, 12ft, "12ft jumbo", or 15ft colossal. Avaiable with choice of indoor or outdoor stand. Feather Flags: Advertising is meant to catch the eye, but the best way to grab attention is with a bit of movement. Our Feather Flags allow your message to flutter in the wind and are crafted to be vibrant, unique, and eye-catching. 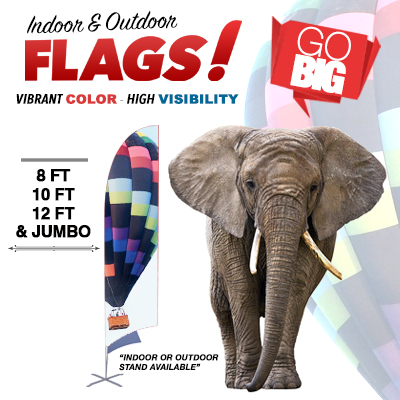 In addition to being printed in full color on one side of 3oz polyester, Feather Flags are available in 8ft, 10ft, 12ft, Jumbo, or 15ft colossal size with your choice of an indoor or outdoor stand. Feather Flags come in increments of 1, 3, 5, 10.